When people get married, the plan is for a long-term collaboration that ideally ends with a comfortable retirement. Typically, couples work and sacrifice to make this plan a possibility by putting money aside in hopes of reaching that long-awaited day. Divorce necessitates the abandonment of these plans, but are the mutual efforts of both spouses towards retirement lost as well? In other words, are spouses entitled to any retirement benefits as part of the property settlement in divorce? This question is of particular concern to couples married for many years, since this asset is likely one of the more valuable, if not the most valuable, property a couple owns. A large percentage of retirement accounts are established and managed by a person’s employer, and the spouse would not, as a consequence, have a right to access the funds independent of the spouse. Further, only marital assets are subject to division in divorce, but retirement accounts and pensions are considered a part of the marital estate in reflection of their importance to an individual’s financial holdings. Given how important this asset is in divorce, a discussion of how they are generally divided, the special considerations for active military, and the essential document that must be completed to make the property transfer official, will follow below. Florida’s law on the division of marital assets says that judges must divide this property equitably, or fairly, but there is a rebuttable premise that the division should be equal. To determine whether equal division would be fair in a given case, the court examines factors that look at the couple’s contribution to the marriage and economic circumstances, among other issues. Essentially, the court has discretion to decide how to divide marital property, so absent an agreement by the parties, predicting the outcome of the court’s decision is difficult. However, while retirement assets are included in the pot of marital property, only the portion that accrued during the marriage is subject to division, which can greatly affect the share a spouse receives. This crucial limitation must be taken into consideration if the parties to a divorce decide to let a court create the property settlement terms. In addition, the division becomes even more complicated if either spouse was active military during the marriage. First, in order to receive a payment of retirement directly from the military, the couple must have been married at least 10 years and the military service must also overlap the marriage by at least 10 years. Thus, a couple married 15 years, in which military service only overlaps five, would not entitle the non-military spouse to direct payment of retirement benefits from the military. However, in this situation, the court could order the military spouse to pay the retirement benefits directly. 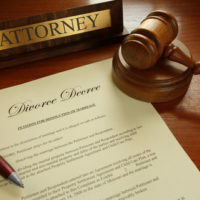 In divorce cases involving the division of retirement assets, many will include, in addition to the divorce decree, a document called a “Qualified Domestic Relations Order” (QDRO). This document creates a right for a divorcing spouse to be paid retirement benefits from the other spouse’s employer-sponsored plan, and specifically lays out how retirement benefits will be distributed. Without this document, a retirement plan will not pay whatever portion was awarded in the divorce to the other party, and the ex-spouse has very limited options to correct the matter. These orders govern benefits paid out of plans covered under ERISA, such as 401k plans and private pensions, and should be drafted and signed in conjunction with finalizing the divorce. Importantly, the content of the QDRO must conform to specific federal law requirements, and an experienced divorce attorney should be consulted to handle this matter to ensure the transfer of payment rights goes smoothly. Divorce is a trying experience, but hiring the right legal representation can make the overwhelming process more transparent and less stressful. Knowing your rights and what to expect at every stage of a divorce case is valuable information that will allow you to make as clear-headed a decision as possible. The Tampa law firm of Bubley & Bubley, P.A. strives to make every divorce go as quickly and smoothly as possible, while ensuring your interests are fully protected. Contact us today for a free consultation.